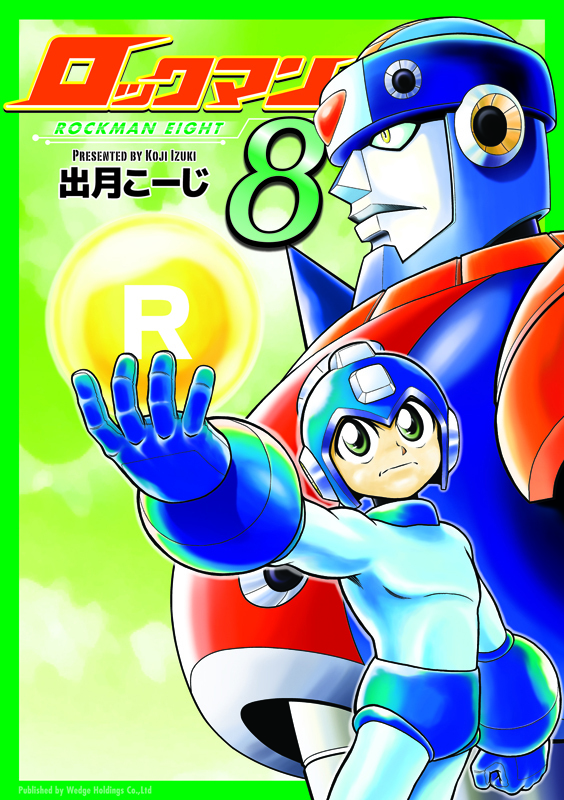 Online retailer Tanomi has unveiled the cover of the 2011 Rockman 8 manga reprint on their preorder page, which features snazzy new art of Rockman and a rather ominous Duo. Author/illustrator Koji Izuki looks to have whipped this one up himself -- a perfect image for this single-volume compilation of books one and two. Tanomi's listing for the book has also updated with a release date, finally: May 27, 2011. The A5 size, 512-page book will ship out nationwide in late May for 2,625 Yen, or roughly $31.00 USD. Enticing fans to purchase the manga through Tanomi is the special offer of a set of limited edition postcards featuring more, exclusive art from Izuki. The cards will arrive with you order, a promotion that is also being offered with Shigeto Ikahara's upcoming Rockman 7 reprints. It is still unknown if UDON Entertainment has any plans to localize Rockman 8 or Ikahara's RM7 reprints. As per usual, future UDON products usually leak out from Amazon so I'd advise you to keep scoping that out once in a while. At least for this one we can say it's definitely new art, rather than recolorings. I found a Duo image in the first book that almost matched up, but the angle is just slightly off. But of course knowing that the cover art is new, now I'm gonna have some absurd hope that there's an additional new chapter or two to help finish off the story, since the original never was complete. Hey...actually...the first two books were 190-ish pages each. So if this new release really is 512 pages, we might seriously have over 100 pages of new content!! That would be awesome news! Why else would there be so many additional pages, I wonder? The original MM8 manga was incomplete like the X4 manga before the compilation? Alongside those two and the never compiled ZXA, is there any other manga incomplete? I wonder why the original manga was never finished? The X4 manga wasn't at the time either, so I guess Rockman just wasn't popular at the time anymore? Of note, everyone, the product description also alluded to some kind of "epilogue chapters." I wasn't sure if that was new material or not. Perhaps this is what's comprising the remaining pages? @Protodude: If it does say epilogue chapters, then yes, it must finally be new content. The originals had no bonuses in the same manner of Ariga's 4-komas/character references. Rockman and Forte Vol. 2 had a little bit, but nothing more than a dozen pages. The original didn't include chapters involving Sword or Astro Man, or the final Wily stages. So it most definitely is logical that they make up those remaining 100+ pages. Wonderful news, indeed! @anonymous #2: Part of the reason behind 8 not being completed was that Izuki had moved on to work on his Rockman and Forte manga. Less about the popularity of the series at the time, more about the timing of it's release. @anonymous #1: Depends. The EXE Battle Story manga kinda ended before Netto and Rock could take on Regal and the EXE 5 scenarios, as I think Takamisaki's manga grabbed more attention and bumped it from future publication. 8 and X4 have always been the two glaring ones, though. It would be cool if both now truly have that added content, years after their original release. That image is taken from the volume itself. It's a short scene after Blues arrives and breaks up the fight between Rock and Duo down in the cavernous area of Wily's fortress. Just as soon as he arrives, Duo scans Rock for evil energy, turns around, and Blues is gone already. Next thing you know, Blues is outside, looks like he's paying some respects, and walks away. Then you see the name on the center of the cross is that of Blues, himself. So no, nobody really died.